Bitcoin is an incredibly popular form of crypto currency. Stored in virtual wallets and processed entirely online by a system of computers using a program known as blockchain, Bitcoin prices have made it the leading virtual currency that has garnered massive attention in financial markets and with consumers around the globe. The 1 oz Antique Silver Bitcoin Icon Round is currently available to purchase online from Silver.com. Ships to you housed in a protective plastic capsule and comes with a Certificate of Authenticity! Third design of Bitcoin rounds from Anonymous Mint! Obverse showcases the popular Bitcoin symbol and computer code background. Reverse features a new design known as the Crypto Icon. Edge lettering denotes the individual serial number. Finished with an antique polish! Art for the series from the Anonymous Mint’s Julie Lindquist. Bitcoin, like all other crypto currencies, offers buyers and sellers complete anonymity in transactions that take place online. The currency is controlled online and held in virtual wallets, allowing individuals to buy from and sell to one another without the aid of banks. Bitcoin and other crypto currency is all controlled by a network of connected computers around the globe, and not by governments or central banks. The new Bitcoin Icon Round from Anonymous Mint is the third design issue from the mint, created by Julie Lindquist. Other design issues from the mint include the Bitcoin Guardian design and the Bitcoin Owl, which features the Anonymous Mint’s logo on the reverse face of the rounds. The reverse of the Silver Bitcoin Icon Round includes the new design known as the Crypto Icon. This image includes a variety of symbols, each of which is representative of industries or services related to crypto currency. Included are clouds, piggybanks, pickaxes, shopping cars, and moneybags. 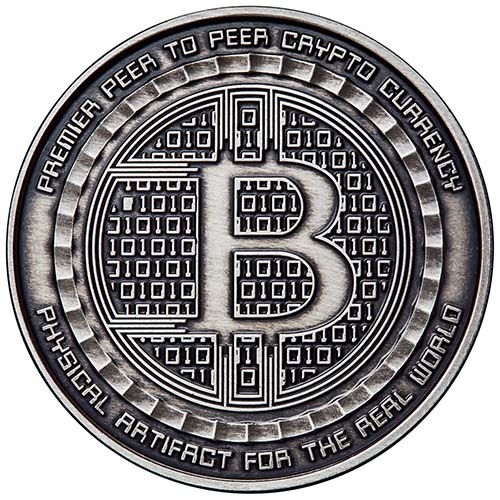 All 1 oz Antique Silver Bitcoin Icon Rounds have edge-lettered, individual serial numbers and include a Certificate of Authenticity with the same number featured on it. The rounds all ship in protective capsules and come with an antique polish applied, which helps to highlight the more intricate details of the design. We encourage Silver.com customers to contact us with questions at 888-989-7223. You can also connect with us online through our live chat and email address.